I love Hi Corbett Field in Tucson even if it is a small, old, and low amenity ballpark. It may have only a small scoreboard and a few concession stands, but the seating options are all quite good. I like the bleachers even though the closer seats are only a few bucks more for Toros games. Besides there is never that much of a crowd at Toros games and you can seat hop, especially during the middle of the week like when we went on Wednesday, July 7, 2010, to see the Toros. It was 100 degrees at the 7pm game start time, but it is a dry heat and it does not seem that bad to me, especially since I spent all of June dealing with hot and humid weather and Texas. Most of the time I do not pay attention to the temperature at game start and end, but it is something we always like to do when we go to Hi Corbett. It is such an easy thing to do, since it is one of the few things to look at on the scoreboard. By the way it was 93 degrees when the game ended around 10pm. 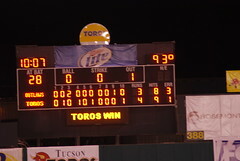 The July 7, 2010, Tucson Toros game was pretty interesting. In the sixth inning there was a real quick, but kind of hard rain shower. 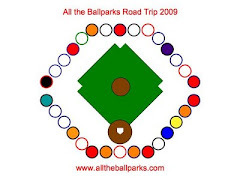 However, unlike the wimps of Major League Baseball (i.e. Cubs delaying start when rain was forecasted and that rain never happened in Game 16 of our trip last summer) they never stopped play. There was a fun run down play between second and third in the bottom of the 6th around when the rain stopped. The best part of the game, though, was the bottom of the 10th, although it was kind of annoying that the Toros allowed the Outlaws to tie the game up in the top of the 9th. In the bottom of the 10th the pitcher for the Outlaws committed two errors making it easy for the Toros to score a run and win the game. The first error was throwing it poorly to 1st base letting the runner not only get on base, but to 2nd base. He then tried to pick off the runner at 2nd and instead threw the ball into center field and allowing the runner to get to third.